Mt America Original Beef Jerky is hand made in Colorado. It is natural hickory smoked; no preservatives; no MSG; no nitrites. Ingredients: Beef, soy sauce powder, brown sugar, salt, garlic, onion, spices. Rainbow Trout jerky is high in omega 3 fatty acids and 10 grams of protein per serving make this a healthy, tasty and thoroughly enjoyable snack. Flavor – A superb blend of herbs and spices and the delicate taste of rainbow trout. No fishy aftertaste. Chewing texture – firm chew. 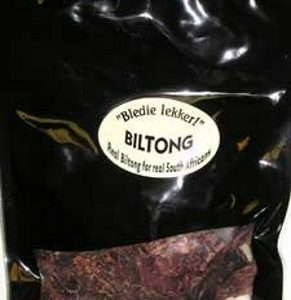 Biltong is made from beef that has been marinated in a traditional South African recipe and then air dried. Made in the USA. Flavor – traditional mild vinegar based Biltong marinade lets you really taste the beef. 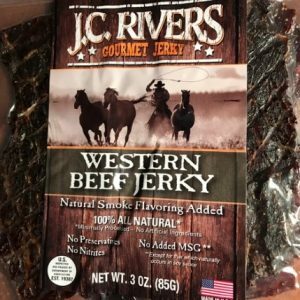 JC Rivers Western Beef Jerky is a small batch jerky handmade from thin slab cuts of top round. These large slabs are easy to tear and chew. Flavor – a complex flavor palate of beef with subtle pepper, salt and mild sweetness. 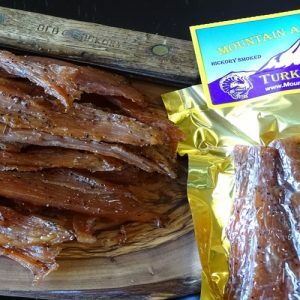 Mt America Turkey Jerky is a gourmet jerky, handmade in small batches every day, this jerky is always fresh! Flavor – made from solid strips of turkey breast, then hickory smoked and seasoned lightly with salt and pepper. 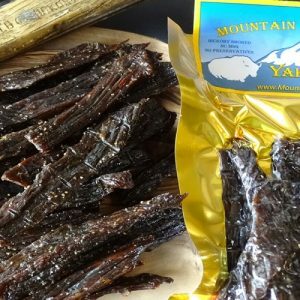 Mt America Yak jerky is a lean and delicate flavor meat and is a staple food in the Himalayas and south central Asia. Yak is lower in calories and higher in protein than beef, bison or elk.